Translation it is that openeth the window to let in the light; that breaketh the shell, that we may eat the kernel. How does one spin gold into gold? Light into light? How does one avoid fracturing the wings of a poem while moving it from one linguistic nest into another? Do translators owe their loyalty to the shape of a poem, its meaning, the way it sounds when read out loud, or to that intangible essence it leaves in its wake when we’re done reading? I don’t have an answer. I suspect that good translators attempt to cover all of the above. I suspect that each poem demands its own kind of translation. This being said, I’m often haunted by the ghosts of poems I read years ago. I may have forgotten their titles, who wrote them, what they sounded like or what they were about, but I always remember how they made me feel. There are multiple reasons to dedicate a corner of this sprawling nest to translation. I’ve written in both Romanian and English. Even though I had to choose the latter for purely practical reasons—there weren’t enough hours in the day to write in both languages, so I adopted the language of the country that adopted me—my love for languages began with my mother tongue, Romanian. Twenty years after my move to the US, I continue to serve as a conduit between my Romanian and American families. Now that we live in Switzerland and have added yet another language to the mix, to say that I’m linguistically confused is a euphemism. The whole trajectory of my life appears to be work in translation, as I move from culture to culture, losing something and gaining something along the way. Some part of the poem’s essential life, its way of traveling through the world, must pass through the emptiness that runs like a broad river-gorge between languages: the impossibility of any word, even the simplest, remaining the same in a different tongue. Writers in exile find their own image in their language. The metamorphoses they undergo on spiritual, cultural, emotional levels are often faithfully mirrored in the body of words. Language itself becomes uprooted, taking on the garb of a fugitive. But what happens when circumstances compel an exile to choose a foreign language to write in? How faithfully will it mirror those metamorphoses? How trustworthy of expressing what we are is a language we were not born into? And where does our loyalty lie when writing in a language other than our own? The poem below illustrates my dilemma when years ago I found myself at a fork in the road. Was I going to keep writing in Romanian and translating my work into English, to fit my new surroundings? Or was I about to adopt a new language and let it begin its silent work, changing me from the inside out? One seemingly minor difference between the Romanian original and its English translation is the disappearance of the ellipsis in the latter. A writer’s choices aren’t always obvious—writing is often an intuitive process rather than a long deliberation; however, the more I thought about the elusive ellipsis, the more its absence alluded to matters beyond the scope of the poem. 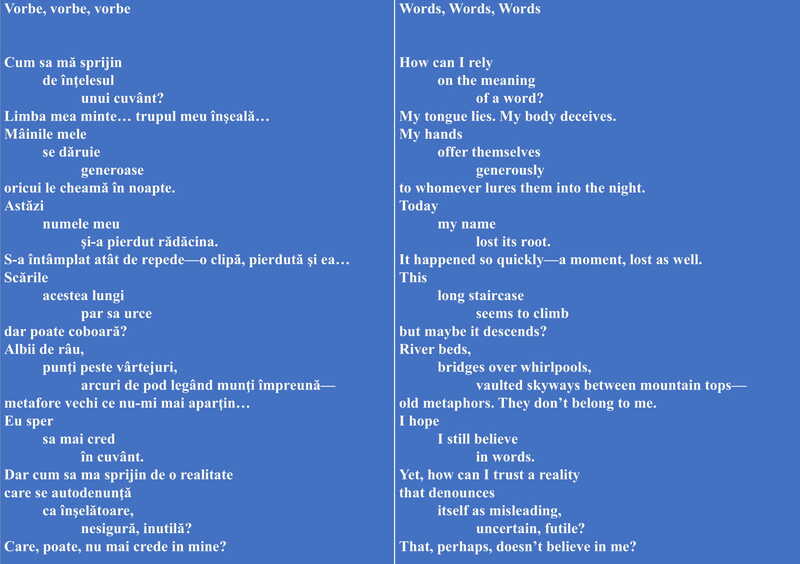 When I first translated my Romanian poems into English, the period felt like a more adequate ending to a thought. I didn’t like how lines trailed off into the vagueness of an ellipsis in the English version. It seemed like a juvenile attempt to instill depth where there was none. By comparison, the ‘Romanian’ ellipsis was comfortable in its own skin. It said as little as it needed to say without being too loud. Then I switched to writing in English and chose to banish the ellipsis altogether. Again, why this choice? I can only speculate based on my experience as an émigré: a writer who started from scratch all over again, writing in a new language with wooden tools, to quote Nabokov. they will find a foothold. The ellipsis hints at a word that dares not be spoken; it’s the possibility of a word broken to pieces. Only in that brokenness can the unspoken word fulfill its purpose and achieve the meaning it seeks. For the sake of the analogy I’m trying to make, let’s assume that meaning is indeed a word’s goal, the terra firma it craves to grow roots in, although nothing is as changeable as a word’s meaning(s); the roots become mingled, entwined, they forget what bulb or rhizome they started from and give themselves generously to other plants, other words, they grow in a canopy that shelters and disguises. Roots are subversive. This subversion might be the actual meaning of words. If the unspoken word can only fulfill its purpose through the brokenness of the ellipsis, then, perhaps, in a similar fashion, writers who lose their roots can be fully themselves only in a state of fragmented consciousness. They may seek unity, not fragmentation; to be part of a whole (a group, a community), not solitary in a crowd; to merge, not diverge. But no matter their quest, the only time they are true to themselves is in solitude—and in solitude they are fragmented. Perhaps the ellipsis didn’t feel right in English because it reminded me too much of the hesitation and uncertainty I experienced on a daily basis. The half-conscious impulse to banish the ellipsis was a way to tell myself that I belonged, that I was indeed part of a whole. A true translation proceeds by the motions of understanding and sympathy; it happens by slow increments, sentence by sentence, phrase by phrase. Nostalgia is sometimes ‘a premonition of absence,’ says Eva Hoffman in her memoir. In 1992, when my family moved from my hometown of Chişinău to Bucharest, I was 19 and experienced what Hoffman describes as the most lyrical of feelings. We have a word for it in Romanian: dor. Romanians say to their loved ones, Mi-e dor de tine. The English translation of this sentence is ‘I miss you,’ but the sentiment expressed is a pale echo of the original feeling. I went back home several times after graduating from the university and found my hometown changed to one of Italo Calvino’s invisible cities that knows only departures, not returns. The streets had narrowed, the houses had lost their colors, the people were not the same: some had left, some had moved, some didn’t remember me. Those differences reflected my own transformation—one that I feared instead of embracing. Like the inhabitants of Calvino’s Baucis, I contemplated with fascination my own absence from a place I still considered home, though it reminded me less and less of the home I had left. Several years later I stepped off a plane in Chicago with an intense feeling of excitement coupled with remorse. I wanted to be more wary of the world I was entering, more sorrowful for the one I had left behind. A poem I wrote about this experience describes how unnatural my feelings seemed to me at the time. Guilt over being too happy shadowed my arrival to the United States. It didn’t help that I loved every aspect of my new life: the sunny apartment in an old house, the quiet neighborhood, the short-lived job in a bookstore, where I hid behind the book stacks to read, until I was fired for not being ‘entirely present’—a mere confirmation of something I already suspected. (How often are we fully present in our own lives?) I loved trying different ethnic foods, getting lost in a supermarket, not having to wash my clothes by hand and dry them on the balcony—I discovered the luxury of a washer and dryer. The place I had come from was no longer ‘home,’ although the place I lived in hadn’t become a home either. I found myself betwixt and between, in a state of cultural liminality. For the first time in my life, perhaps, I became aware of the splintering taking place inside me. The relationship to more than one culture, non-assimilating in spirit and therefore living amid contradictions, is a constant act of self-creation. Artists may be the more fortunate among immigrants, because art is a powerful medium of reconciling crises of identity and culture. 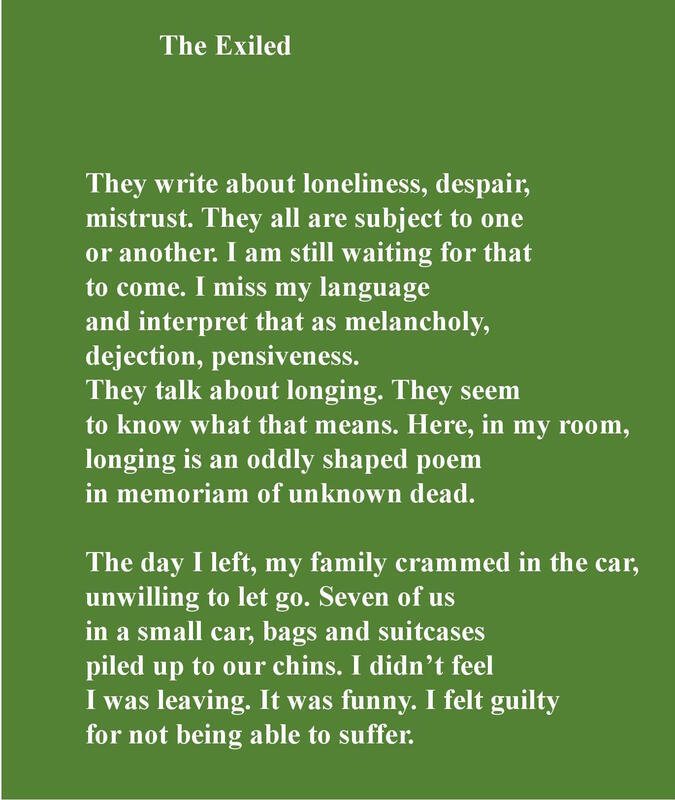 I write in English and the language unfurls, spreads through my limbs, grows into a thicket holding together all my presences—and my absences, too. My transformation has not been without resistance. The comfort of layers one accrues in order to belong can be deceitful. I want to keep my past alive. Allowing myself to be transformed without a struggle would be a form of betrayal. Even when written in my mother tongue, poetry has always been the alchemic element shaping the chaotic strands of a fluid self. Once I shifted to English, poetry became a means of survival. Hence my focus on documenting the metamorphosis, as if the wholeness I sought were within reach only during the act of writing; as if the written words held the master key to a faraway self, one at peace with her past and present, one less doubtful about her future. I can’t help but compare my experiences to those of other writers in exile. Our journeys resonate. The patterns emerging in our wake are dynamic, changing as we change. This process of transformation brings us closer to the comfort of a new certainty: that nothing is certain. We might as well go with the flow. No wonder Calvino’s city knew only departures, not returns—it was so because the city itself was constantly changing. A boat returning to harbor enters the anonymity of a new place, for nothing that has been there before remains the same. The boat herself, a prodigal daughter, is not the same. Aware of our own metamorphosis, we must learn to feel at home in the midst of a voyage, yet also be willing to yield to the seductive thought, on entering a harbor, that this might be our last destination, the place to settle, the estuary, the haven.